Drug driving now carries the same penalties as drink driving, and to mark six months since the change in legislation, South Yorkshire Police and South Yorkshire Safer Roads Partnership have launched a campaign aimed at raising awareness of the consequences should you get behind the wheel of your car while under the influence of drugs. “Almost 50-years ago, the drink drive law was introduced and drivers had to learn, understand and adhere to the law to keep themselves, as well as others, safe on the roads. “This is the aim with our campaign; we want drivers to understand the implications of driving under the influence of drugs and to raise awareness with drivers that drug driving now carries exactly the same penalties and consequences of drink driving. On March 2, this year, the law changed regarding drug driving. Previously it was only an offence under Section 4 of the Road Traffic Act (RTA) 1988, driving whilst unfit through drink or drug. It is now an offence underSection 5A Road Traffic Act 1988, driving while over the prescribed limit (OPL), as with drink driving. There are legal and illegal drugs that are included under the new law and limits have been set by the Government for both. Roadside drugs kits are now used by officers if they suspect a driver may have drugs in their system, alongside field impairment tests that have always been used when a driver is suspected of being under the influence of drugs or alcohol. The kits highlight within minutes if a driver has either class A drug cocaine or class B drug cannabis in their system, resulting in the driver being arrested and taken into custody where a blood sample is taken and sent away to the lab to determine the actual amounts of the drug present. “We developed a strategic and tactical plan to utilise the roadside kits effectively, and in the last six months we have conducted 328 roadside tests, which have resulted in 184 arrests. “This equates to 56% of drivers tested having drugs in their system, which is quite concerning and we want people to realise they are potentially risking their life, as well as others, if they get behind the wheel of a car under the influence of drugs." “Driving under the influence of drugs is extremely dangerous and can affect driving skills in a number of ways; your reaction time may be slower, your vision can be distorted and your concentration may lapse. “The Safer Roads Partnership is trying to educate people that driving when you are unfit to do so because of any type of drug in your system puts you, your passengers and other road users at greater risk. "If you are taking prescription or over-the-counter medicines and you are not sure if you should drive, talk to your doctor, pharmacist or healthcare professional. “As part of the change in legislation, all our young driver safety interventions which are delivered in schools and colleges now include information about the changes and the dangers of driving while under the influence. 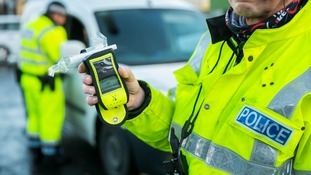 100 drivers were arrested in December for drink and drug related offences. That is an average of 3 per day. In the first 3 days of the campaign 8 people arrested for drink/drug related driving offences, on the very morning during the ‘official’ launch (4th Dec) the 9th driver was arrested. By 12th December 36 people arrested had been arrested and by the 19th December that number had risen to 57.